Samsung Galaxy Tab S2 review | What Hi-Fi? When looking at a new tablet, it’s difficult not to draw immediate comparisons with the iPad Air 2 – our current Award winner and arguably the best tablet on the market. It’s even harder when the tablet in question takes its most obvious rival on head-to-head in the spec department. The Samsung Galaxy Tab S2 does just that, in a departure from its previous flagship tablet range. While the first Galaxy Tab S opted for a 10.5in (or 8.4in) screen in a 16:9 aspect ratio, the Tab S2 sticks more closely to its rival’s dimensions, offering the same 9.7in display (though there is a smaller 8in version available too) with a 2,048 x 1,536 resolution and a 4:3 aspect ratio. This will split some people right away – while 16:9 is a better aspect ratio for watching movies (since you don’t get black bars), it makes a tablet more cumbersome to use for just about everything else. For this reason, we prefer a 4:3 design overall, but it’s worth bearing in mind. The Galaxy Tab S2 beats its competitor in slimness and weight though, at just 5.6mm thick (vs 6.1mm) and weighing in at 389g (vs 437g). You won’t really notice its slimmer profile, but the lighter form does help when holding it for longer periods of time. This is managed thanks to the S2’s plastic back panel, which is rounded off with metal edges. It’s a clever move that gives you the cool feeling of aluminium on your palms, while reducing the heft of an all-metal body. Elsewhere the design is very much Samsung. It keeps the light-up touch buttons on the bezel that we’ve seen on its smartphone design, alongside a physical home button that doubles as a fingerprint scanner. The power button and volume rocker sits on the upper right hand side when holding the tablet in portrait, and there’s also a microSD card slot for boosting the 32GB on board storage. The 9.7in screen is an AMOLED display, and squeezes 264ppi into its dimensions. That makes for a screen every bit as sharp as the iPad, but not necessarily as talented. As with Samsung phones recently, we really struggle to get a colour balance that feels right. Using the Adaptive Display mode (which defaults to AMOLED cinema for much of the time), colours appear very vibrant indeed, which is fine for flicking around menus and browsing, not to mention initially very impressive indeed. But when watching a film, colours tend to appear unnatural and overdone, lacking the subtlety that the iPad offers in tonal shading. Watching on AMOLED photo or basic mode helps tone things down, but subtlety still falls short, while whites get a yellowy tinge that affects their impact in darker scenes. Blacks are great whichever mode you use though, and go deeper than the iPad can manage, without losing detail. Edges are crisp and defined throughout, and there’s plenty of detail up for grabs to give you added insight. You won’t have to worry about using this outside either – this screen goes seriously bright, and you should have no trouble using it out in the sunshine. The Tab S2 is quick in use, with Samsung’s own octa-core processor at the helm, supported by 3GB RAM. You might find a few judders during heavy multitasking or on more graphic heavy games though. Our playthrough of Cut the Rope is stable enough but we do notice gameplay isn’t always entirely smooth when playing something like Sonic Dash. It’s not enough to ruin casual gaming, but those more serious about it might find these occasional hiccups a touch frustrating. The Tab S2 runs on Android Lollipop out of the box but is now fully updateable to Marshmallow 6.0.1. As ever, Samsung’s TouchWiz runs on top of it, but as we’ve seen in the company’s phones, it’s increasingly taking more of a back seat to proceedings. For a start, it’s much cleaner and reserved than previous iterations. You’ll find Briefing, Samsung’s own Flipboard-style newsfeed, a right swipe away from the homepage (though you can replace it with Flipboard if you wish), and a Microsoft suite of apps built in – but, aside from Samsung’s core apps, that’s about it. Battery life from the 5870mAh battery is reasonable and we manage to get a good few days of testing without needing to charge it up. With average use you could hit well over 10 hours – a 90-minute Netflix video at full brightness and half volume drained around 14 per cent of the S2’s battery compared to 26 per cent on the iPad. Headphone jacks are still cool here, as is high-resolution music support up to 24-bit/192kHz. The stereo speakers on the bottom of the tablet aren’t up to much though, and lack a great deal of detail and weight. They’re clear and loud enough for short dialogue-heavy video at a push, but expect everything to sound a little bit flat and one-dimensional. It’s much better to plug in your headphones for music or movies, where the sound is hugely improved. Immediately, music sounds clear and open, with a good amount of depth and detail being dug out across the frequency range. Vocals are expressive, basslines are tight and the treble is well-controlled, with enough get up and go to keep you engaged. The S2 times well too, not quite as well as the iPad, but good enough drive to keep your toe tapping, and with enough confidence that gives it a good sense of authority. If pushed, we still prefer the iPad’s slightly richer, more subtle sound, which holds itself together better than that of the Samsung, but the gap between the two is getting closer. The Galaxy Tab S2 features an 8-megapixel camera on the back and a 2.1-megapixel camera on the front. Your phone is likely to take better photos than either of these cameras, but they’re at hand if you need them – particularly the front-facing camera for video calls. It’s quite grainy and struggles in low light, but give it enough light to work with and you’ll get a decent enough image for Skype and the like. The main camera offers better results, but you’ll still need optimum conditions to get anything worth sharing much further than Facebook. As ever, shots taken outside in good light are your best bet – they’re crisp and well exposed, with a decent colour balance, but with a closer look they do lack fine detail. 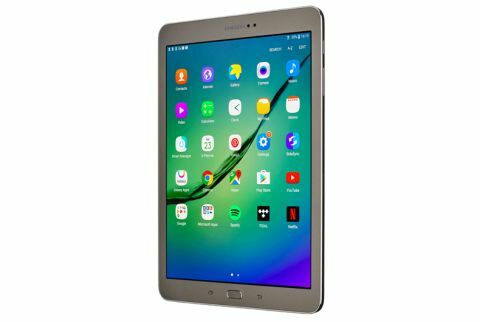 The Samsung Galaxy Tab S2 is a good Android alternative to the Apple iPad Air 2, but doesn’t quite bring its A game to the table as strongly as its rival, struggling to match it in the handling of both music and movies. The overall performance leaves very little to grumble about, and its expandable storage will be a draw for media hoarders who’d rather not fork out for Apple’s pricier built-in options. For now though, Apple’s tablet remains our top pick for making the best of your music and movies, but we’ll be keeping a keen eye out for the Galaxy Tab S3 at MWC 2017 to see if it Samsung’s new flagship tablet can finally best it.